It's a fair wager to say there is much we take for granted in this world. These things may vary depending on your location, personality, or station in life; perhaps you take for granted that there will always be a roof over your head, or food in the fridge. Perhaps you take for granted that the trains always run on time, or that the sun will rise each morning. The more regular and commonplace something seems, the more likely we are to assume that's exactly what is: ordinary, boring, mundane. But what if that wasn't the case? What if it was all a masquerade, calculated strictly for the benefit of your unseeing eyes—and that little old lady sitting next to you at the bus stop was not quite a little old lady at all? That's the basic premise of the mundane masquerade: your world is not what it seems, and someone is going to great lengths to keep that from you. There exists another layer to reality hidden in plain sight that, if revealed, would alter the very foundation of your day-to-day beliefs. This trope is an old one, but its history is a little harder to nail down than most of those I've tackled before. While folklore and mythology are running over with examples of human beings conducting their affairs without realizing there's a whole other supernatural world right beneath their noses, the nature of this unawareness differs from source to source. Many of the creatures and entities in those kinds of stories escape notice due to pure human ignorance or an unwillingness to believe in fairies (so to speak). As such, they're not really examples of a mundane masquerade, since there is no outright deception at play. There are some tales of supernatural mischief that fit the bill quite nicely on the surface. For instance, the selkie, a mythological shapeshifter that lives in the sea, but occasionally sheds its seal-like skin to take human form. 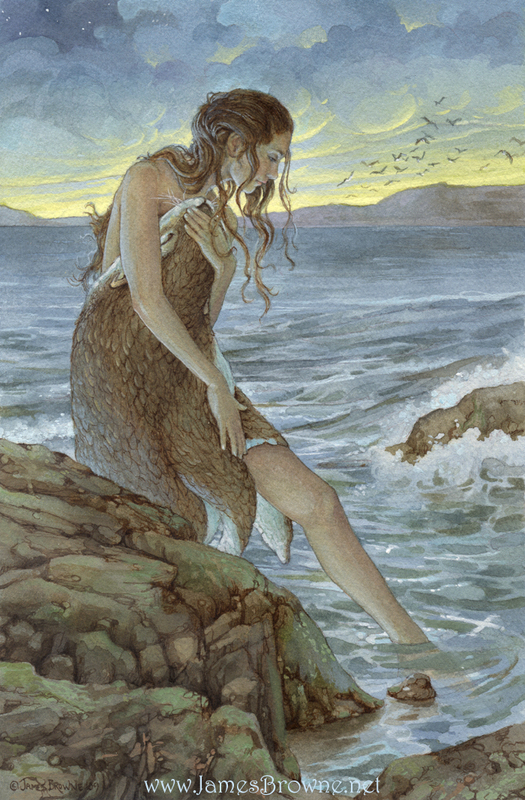 Selkies were often said to have taken on unsuspecting human lovers, hiding their true nature until their return to the sea. Another example is the changeling—stories in which a fairy, elf, or some other entity swaps its own offspring with that of a human being, usually with the child's unfortunate mother and father none the wiser. These and many other tales involve supernatural deception of a sort, but still don't quite offer instances of true masquerade, since it's not the existence of the otherworldly itself that is being hidden, but the evil deeds thereof. For a better example of the mundane masquerade in fiction, we can point to an excellent modern use of the trope: Men in Black. The eponymous organization of the movie series (and the comic books that inspired them) is shown to have worked for centuries to keep mind-shattering secrets from the public at large—specifically, the existence (and earthside residence) of extraterrestrial beings. In the comics their mandate even extends to supernatural creatures such as werewolves and demons, as well. The MiB's web of intergalactic espionage and secrecy is so far-reaching that they use their acquired alien technology to erase the memories of anyone unfortunate enough to witness extraterrestrial events. One of the reasons I point to Men In Black as an excellent example of the mundane masquerade, aside from its rigorous adherence to the trope itself, is because I think it really gets to the heart of just why it has persisted in fiction and popular culture for so long. The secret organization depicted in the MiB franchise is based on an actual real-world mythos that has surrounded conspiracy theorists and UFO enthusiasts since the 1950s. Following the Roswell incident and the subsequent explosion of popular interest in UFOs, stories began to emerge of mysterious men in nondescript black suits interviewing and harassing people involved in UFO sightings. They were usually said to have identified themselves as government agents of some kind, but over the years the various stories have spread from one end of the rationality spectrum to the other, depicting them as everything from Air Force OSI officers to telepathic crossbred alien hybrids with multiple sets of eyelids. The point is, there are people in this world who believe that many aspects of this trope exist in the realm of cold, hard fact. And in some respects, they're right. Virtually every major government in the world maintains various operations at a certain level of secrecy, hidden from the very public they serve, from the CIA to MI6. But some believe that this extends much further than foreign intelligence or national security. Some believe that the government may well be hiding something else from us—something otherworldly, perhaps. Whether you count yourself among the conspiracy theorists or not, I think it's plain to see the relationship this trope has with that aspect of our culture. It's simple human nature to assign malevolence when someone in a position of authority decides whether or not you "need to know" something, especially when your tax dollars paid for the stationary they printed it on. Theories (or delusions) such as the mundane masquerade are absolutely fascinating to me. I've always been very interested in delusional mental disorders, it's in fact the reason I'm interested in conspiracies (real ones and crazy fake ones) -- they exemplify the extents that such a delusion can push people to go, and how much the brain is capable of constructing to justify such a delusion. Totally fascinating! I love MIB, really enjoyed watching The Changeling, and I believe Harry Potter also pretty falls in this category, as the Muggles are unaware of the magical realm and the wizards try really hard to keep it that way. The potential for great storytelling tension and stakes is enormous, particularly in science-fiction. I'm already swarmed by crazy story ideas. Great post! I agree with you on the potential for tension and high stakes that a good use of this trope can offer. Create a big secret in your world with a powerful group of people protecting it, then throw your character and an unwitting discovery in the mix and you have instant story conflict. Lots of great tales have been told using this trope. Any post that references MIB is all right in my book! ;) All seriousness, though, another great post. I learn so much about tropes from you and this is no exception. Oh, and PS--thanks for stopping by with your kind words---meant a lot!!! Men in Black is a near perfect use of this trope, and also illustrates how those behind the masquerade don't always have to be the badguys. No problem, Randi. And same to you—thanks so much! Haven't used this trope yet, though I have an idea how I might in a story I'm mulling over. It certainly seems that way to some folks, doesn't it? Good luck with that story, Alex. Those are excellent examples. Especially the Matrix. The concept of that movie blows my mind. I've used this trope before. I hope to use it again soon and actually do it justice! The Matrix is one of the coolest movies ever made, for sure. And the concept itself is so compelling that there are people who believe the underlying premise might actually be real. As in, we are all living in a simulation of some kind. There are actually scientists in the world investigating this as an actual hypothesis. Hope we're not batteries!